The beginning of the beginners chip or the desire chip. An outward sign of an inner commitment to try our way of life (to stay sober) for 24 hours, are there any takers? If it doesn’t work for you we will gladly refund your misery. “In 1950, the year of his death, (Dr. Bob Smith) carried the A.A. message to more than 5,000 alcoholic men and women, and to all these he gave his medical services without thought of charge. Sister Ignatia was born in Ireland as Bridget Della Mary Gavin on 2 January 1889 at Shan valley, Burren, in CountyMayo. Having moved to the United States, in 1914 she entered the Sisters of Charity of St. Augustine in Ohio, at which time she took the name Sister Mary Ignatia. A superb musician, she was assigned to teach music. She did this for about ten years, but found it “too hectic” and suffered a nervous breakdown. When she recovered, she began working as a nurse. On August 16, 1935, Sister Ignatia was in charge of admissions at St. Thomas Hospital in Akron, Ohio. She and Dr. Bob Smith admitted the first alcoholic patient who would be the first of millions to participate in the Twelve-step program of recovery, the beginning of Alcoholics Anonymous. The founding of Alcoholics Anonymous is a topic of great discussion within AA literature. It is a discussion that is carried over into the meetings themselves, and many members pride themselves on rekindling the spirit of our ‘pioneering times’, claiming that the program and fellowship itself have been watered down, diluted and misdirected. The issues of sponsorship and carrying the message are the spearheads of this controversy, despite the 10th Tradition’s complicit suggestion that it be avoided. Although, this suggested point of tradition explicitly warns against involvement in ‘outside issues’ and ‘public controversy’. This may obviously mean that inner controversy and inside issues are tolerated, loved and accepted. Something that is undermined and often overlooked in AA meetings when discussion of its history arises is the fact that many non-alcoholics were i involved in the conception and evolution of the organization itself. In fact, were it not for these professional normal and temperate drinkers, AA may not have survived its early days of growth and sustainability. One such person is Sister Ignatia, a particularly spiritual figure in AA past that seems to have eluded the more predominant and popular AA literature. There is scarce mention of her in the Big Book itself. In fact, one will only find casual reference to her in the opening monologue to Dr. Bob’s story (of which the excerpt is provided above). Her name does not appear in the first 164 pages. A long list of normies adorns the history of Alcoholics Anonymous. In addition to Sister Ignatia’s contribution are Sam Shoemaker, Dr. Carl Jung, Father Dowling and Lois Wilson herself. Without these people AA may not have ever become, and it is clear that their involvement with the fellowship has vastly improved and helped evolve the AA way of life. Leave anything up to a group of sorry drunks and they will muck it up every time. Yes, in the beginning it was the non-alcoholics that pointed out the frailty, strength, opportunity and danger inherent in the largely growing and developing sobriety movement that is now called Alcoholics Anonymous. It wasn’t until AA became the guiding force in sobering up drunks that alcoholism became seriously considered and treated as a legitimate disease. Before the 12 steps, problem drinkers were looked upon as derelicts and miscreants whose real issue was moral deficiency. When Sister Ignatia fell victim to the belief that she and a few other interested medical professionals could treat drunks as patients, the tide on alcoholic recovery really began to take its turn. The stigma associated with alkies was that they were doomed, hopeless and helpless. At first, Sister Ignatia began treating drunks in secret, with the help of Dr. Bob Smith and another ER intern they were admitted as having gastritis. As their treatment proved successful, soon alcoholics began being brought through the front door of the hospital and a ward was secured for this work. No longer were drunks locked up and administered Belladonna treatment for their ailments. The real problems with these people were addressed, and in 1935 the first official admission of an alcoholic patient was made. The telephone rang and Sister Ignatia answered it. “This is Bill, Sister. I’m sorry, but I’m going to have to send you back the Sacred Heart Badge. I’ve had a rough morning and I’m going out to get a drink. Sister Ignatia prayed hard all afternoon and, finally the call came from Bill. After sobering up for a few days, Sister Ignatia would present these patients with a token, representing personal commitment to God, Alcoholics Anonymous and the 12 step program. The only requirement for accepting this ‘Sacred Heart Medallion’ is that if the patient was considering a return to the drink, the coin would first have to be given back. This is a tradition we carry on today in the rooms of AA when we hand out chips decorating members who have achieved increments of continuous sobriety. Sister Ignatia claimed that the real back bone of this effort was Ann Smith Dr. Bob’s Dutiful wife. When Sister Ignatia was not sure of what the next right thing to do and did not want to bother the Dr. (Dr. Bob) with every dart and fiddle for there were 5000 that found beds and a new way of living. She would rely on Ann, as she always knew exactly what to do. Sister Ignatia also claimed that women had a harder time getting sober because they would have the innate ability to stay in denial that much longer, Ann would always have insights otherwise denied to others. In a collaboration with Dr.Bob they convinced the powers that be, the hospital board to put on an alcoholic wing. It was paid for and built by the alcoholics. The wing was named Rosary Hall because every time you saw a rosary you would think of prayer and it was through the prayers of the penitent that this work and this wing was there. The Sister wanted to name it after Dr. Bob and in a way she did, it was finally called Rosary Hall and then she added the word Solarium in honor of Dr. Bob’s Initials, Robert Holbrook Smith as it is his initials that are found on the entrance doors RHS. Sister Ignatia has been nominated for sainthood (canonization and beatification) by the Roman Catholic church. The requirement for sainthood is that she had performed three verifiable miracles while she was alive and at least one verifiable miracle after her death. For this end We have resurrected her likeness of image and her story and are sending them around the world, because sometimes even a saint needs a leg up. Very informational reading! I have been to fundraisers in Chicago for a womens recovery home,aptly named Ignatia House of Recovery for women.AA saved my life. I could never repay AA for all the positive things it has brought to my life.I’m an active member and participant in AA.My sobriety date is June 30,2000. Thanks for the piece of AA History, it is always great to hear of the “old Timers” and the history of some of our traditions. 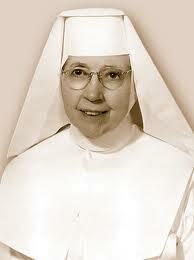 Although Sister Ignatia was not “one of us” she was definitely was instrumental in our (AA) early days. 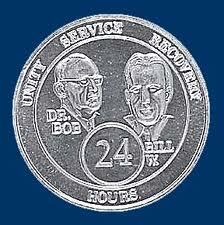 She along with Dr. Southworth and others help Bill and Bob format the miracle that became AA. A miracle is described as something outside the realm of nature, for Bill, Bob, myself and the millions of drunks who are sober, that is outside our realm, and truly a miracle. To alcoholics all over America, Sister Ignatia is called “Little Angel.” She is indeed small and frail, but her strength is that of a Michael and her message that of Gabriel. Both the humble and the great who “died” in drink and became “new” again will attest to that. Awe inspiring. I’m reminded once again, this oh so powerful deal I’ve been blessed with. All those big names, who were not all in recovery but so a part of who we are today. Thank you for including me in this email. As I leave, may I share with you some big names that allowed me the opportunity to stay, through their love, compassion and outstretched hands. Dr. Paul. Father Joseph C. Martin. Dottie Shore. Father Bill Wilson. Big Book Mac. Alfred Mendoza. Ray Contreras. Don Morgan. Gene Webster. John Pollard. Rito. Waterfront Mac. Machine Gun Gilbert. Evan. Robert Gomez. Gilbert and Bob Espinoza. Ralph Lona. Shellie Weise. John Ferraro. Joseph Pirsch. Jung. Here lies the foundation and introduction to my God. June 15, 1985 this coming June will be 28 for me. I remain impressed with the power of the very personal transformation I’ve discovered through the twelve step process. Of myself I am nothing, the father doeth the works, and he has done that very thing for me through each of you. Eternally grateful Jesse. When I parted ways with alcohol some years ago, I thought I had lost key friends, but God opened gates for others.Most of my old friends have emulated my move and have become responsible people in society. I have no regrets and there is no turning back.I have used the little cash I would use on alcohol to transform the lives of the less fortunate in society. thank you! this was one story I never heard! I believe that if newcomers read information like this, they would begin to feel the connection. I read books on Bill & Lois & Dr Bob during early sobriety & it helped me so much. I will be celebrating 32years, God willing, on August 1st.!!! I am a 24 year clean Addict who is a proud card carrying member of Narcotics Anonymous……I used for 22 years and now i have more years clean than I used……..just remember E.G.O. stands for Edging God and Out also Recovery is a journey not a destination and use the rest stops God provides along the way. Thanks for this interesting peice of history.I love learning about the early days and what worked then that we somehow seem to be missing today! Just to inform those of you who may not know, if you post about being in an anonymous fellowship, with that fellowships name and with your full name, you are violating tradition 11. AA has a public relations policy “press, radio and films”..by posting on here with first and last name, you are connecting your name with Alcoholics Anonymous at the public level (as this is a public website). Such a wonderful woman, a wonderful story! Through heart,she did a great contribute to society! thank you i will pass this forward….I needed to hear this story today. I was just invited to join this web-site and am looking forward to hearing wonderful stories about AA and the ppl that contributed to this wonderful program. I was invited to join this web-site and am looking forward to hearing about the early days of AA. Thanks for you invitation and looking forward to work with you all . Godbless. I am recovery with 2 year and I atend meeting of n.a 4 for all this 2 years , i. Like to know more about recovery, differrent things.